When I'm still a student, one of my favorite subject is Chemistry. And if you had chemistry before then you already heard about the Periodic Table. Fast forward to computer age, its now easier to study the table by using an interactive app rather than keeping up with a large chart. 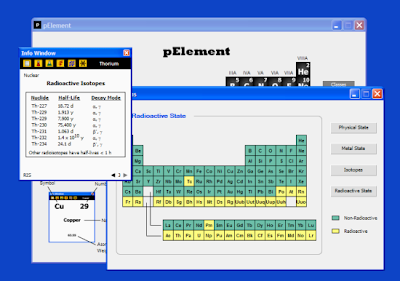 pElement is a free reference tool for Windows on the periodic table. It contains over 65 information items on each element. Information included are melting point, boiling point, density, year discovered, oxidation states, electronegativity, electron configuration, crystal structures and lattice parameters of all stable phases at atmospheric pressure (190+ total phases), and half-lives and decay modes of 660+ radioactive isotopes. This app is recommended for high school students taking chemistry classes and college students taking science and engineering classes, teachers and professionals.